Do you want to lose weight by running? You are not alone. The best part is that it is easy for you to get started. As you start reading the beginning of this article, clearly you know that running is a great way to lose weight. What you may not know is how easy it is to start a fun running program. Wouldn't it be amazing if you woke up each day a little more refreshed than the day before. Imagine looking in the mirror and seeing a thinner you - with lower body fat to boot! As you read each word on this page, you will learn five quick steps to get on your way to lower body fat and more energy that you ever thought possible. Are you ready to lose weight by running? Let's get started! 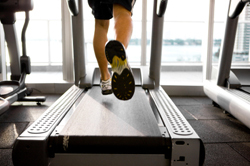 If you want to lose weight by running, the first step is to clearly define your goal. Everyone knows that you need a goal to succeed. What you many not know is how to set a goal that leads to success. You have to be clear in your own mind what you want to get out of running. That is because running to get faster is not the same as training for a marathon. And neither of those is the same as running to lose weight. But why do you need a goal? Most weight loss plan take a "one-size-fits-all" approach. For you to find success, you have to have a plan that is tailored to YOU. How much time do you have? How fit are you? Only a plan built around your wants and needs will be truly successful. Since this article is to show you to how to lose weight by running, I will not go into the details of how to set a SMART goal. If you want to know more, read this article on SMART goal setting. The next step to lose weight by running is for you to figure out what type of plan best fits your lifestyle. There are many plans to choose from (or even mix-and-match). 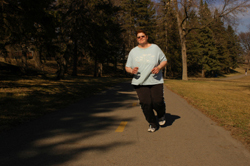 If you choose the run-walk method, you will walk for a short amount of time, and then run for a small period of time. You will then repeat the cycle for a certain number of repetitions. As you get fitter, you should shrink the amount of time walking and grow the amount of time running. If you want to use steady state plan, you will do a slow run over a set length of time. This plan is easy to do on a treadmill, but much more fun (in my opinion) when you run outside. When you use threshold plans, you want to run as fast as you can, while still being able to run for a fair length of time. It is slower than a sprint, but faster than the steady state. I like to call the Farlek method the "artist run." That is because it is more "art" than science. When you use the Farlek plan, there are no set tempos or intervals, only a set time. You should speed up when you feel like you need to, and slow down when you feel like you need to, mixing and matching as you run. Interval training is a lot like the run-walk. You run, and then walk, or slow down, for a "rest" period, Rinse and repeat. The difference is that you will not be decreasing the walking period or increasing the running period. You will only run harder and faster during the runs as you get fitter. HIIT is to Interval training as threshold is to steady state runs. That is with HIIT, imagine you are doing intervals, but the run part is shorter and faster than the interval plan. That should give you a good list of the types of plans that are out there for you to choose from if you want to lose weight by running. Now, this is part that most people forget when they think about losing weight by running. Fortunately, you are here, so you will not be one of those people! Imagine this... you have gone out 3 days over the last week. You ran hard, and are feeling excited to step on the scale to see how much weight you lost by running. You see the numbers changing. And then your heart sinks. Gain 3 pounds. Huh? What the heck happened? Eating to run is hard. If you are like me, the more I run, the hungrier I get during the day. And what happens to a lot of us, is that we think to ourselves, "I ran hard today, I deserve this cupcake." If you are not careful, you will go down the path to eating too much and ruining the fat loss effect of the run. I have seen it happen too many times to count, and I have gone down that path a time or two myself. Run the same and eat less. Run more and eat the same. Fact: There are special diet needs for runners. You should try to get 60% of your calories from carbs. 20% of your calories should come from protein. The rest (20%) should come from fat. And do not forget about water. Stay hydrated! Fact: The basic rules of healthy eating still apply to you. You need to eat smaller portions of the calorie and fat dense foods. You should eat more fruits, veggies, and whole grains. By now, you have a goal, you know the types of run plans that are out there, and you have a food plan. Now it is time for you to build a total training plan. Putting together a training plan is a bit like being a good detective. You need to answer the 5 W's. Who, what, where, when, and why? How many have you answered so far? Why? This is your goal. Alright! Now it is time to fill in the blanks! Want to Run to Lose Wieght? If you recall your goal, you used the SMART way to set your goal. This is where we really hit the A - Action-Oriented. You have a greater chance of reaching your goal if you are clear about the actions you are going to take to get there. What plan are you going to use? Will you use the run-walk method? Interval training? Try the Fartlek method? When are you going to increase the intensity in your plan? When will you run? Mornings? Afternoon? Every other day? Weekends only? Once you have answered these questions, you will have a plan that will be key in staying motivated to reach your goal to lose weight by running. The fifth step in running to lose weight is to go out an do it. This is where most plans fail. They are never put into action, and instead collect dust on your shelf or eat up space on your hard drive. So, go out, get a good pair of shoes, stretch, and get running! 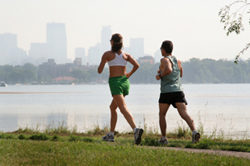 Before you know it, you will find that it is easier than you think to lose weight by running!